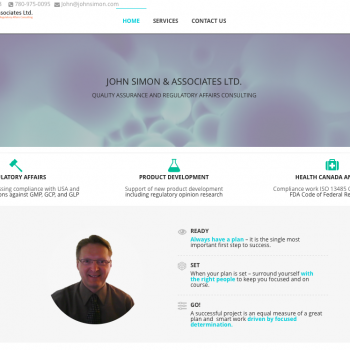 Services – John Simon & Associates Ltd.
JOHN SIMON AND ASSOCIATES LTD.
John Simon is a Senior Member of the American Society for Quality and a Certified Quality Auditor through the Regulatory Affairs Professional Society, with extensive experience in Medical Device, Pharmaceutical, Biotechnology and Natural Health Product industries. Our consulting services range from regulatory affairs and quality assurance services to new product development and certification. Quality Assurance Management services for a Biotechnology company. Involved with the validation series for the manufacturing of a fast track drug. Quality Assurance Consulting services provided to support process validation; consistency series manufacturing; and Pre Approval Inspection (PAI) preparation. Preparation activities for both FDA and European Union inspections. On-site support for the FDA PAI. Commercial Production batch record review. Review and assessment of deviations, CAPA and Change Control. Failure investigations of Manufacturing Facilities. Clinical Trial protocol writing and review to assure compliance to ICH E6. Clinical Trial Applications, CTA and IDE. For cause audits and associated CAPA review. Health Canada audit preparation and audits. Copyright All Rights Reserved © 2012 John Simon and Associates Ltd.